When my brother and I were growing up, our father was fairly adept at building things (mostly out of wood). Nothing elaborate or particularly inspiring and a lot of his projects revolved around repairing things that either wore out or were broken by my brother and I (while horsing around). My mother grew vegetables in the garden and we were told that self-sufficiency is a GOOD thing. I still feel that way today. We’re taught certain things as children that stick with us throughout our lives and that was just one of the things that stuck with me. People who build their own kites enjoy a level of self-sufficiency that most of us don’t enjoy, and I envy that capability no matter what style of kite we’re discussing. The same thing applies to all the other accessories and do-dads we use in pursuit of our most treasured of sports (kiting). If you can create or build something that someone else finds useful, chances are you’ll see a LOT of kite fliers using it because word spreads rather quickly in our world. 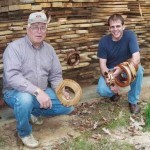 Curtis Bias makes custom wooden Yo-Yo and Halo style winders (kite line reels). That single statement is very true but doesn’t even begin to tell the full story or shed any light on the process, art, resources required or the skills involved. Neither does it say anything about the man himself (Curtis), his involvement in kiting or anything truly specific or informative. An analogy might be to say that, “Tom is an attorney”. Well, Ok … we know Tom is an attorney but what kind of law does he practice? Real estate? Divorce? Criminal? General litigation? Corporate? Again, that statement doesn’t say anything about the man himself or more precisely, what he’s really involved with (or even if he’s any good at what he does). 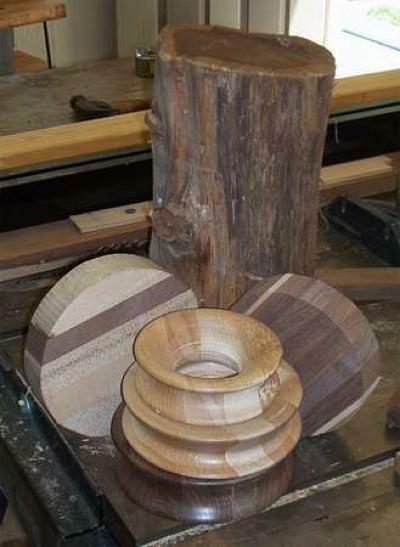 Bias Boards of Shreveport, Louisiana (website link) is the home of Curtis Bias winders. On the few pages presented on their website, you’ll see even fewer pictures of wooden kite reels and one image of Curtis at work. That single picture conveys to us that indeed, Curtis makes his winders by hand. But, even that knowledge doesn’t begin to tell the full story (although it is a fairly dramatic image). The picture is, however, where our story begins and what drew me to Bias Boards. 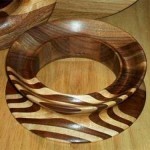 What do you need to make a wooden kite reel? Obviously, you need wood. Where does the wood come from? Trees, of course. Ok … so where do the trees come from? In this case, the back yard of Curtis and Eugene Bias. Nestled in a sprawling woodland, their home and workshop combines the talents of both Curtis and his father Eugene, where they indulge themselves in a labor of skill and art. The labor begins with the felling of a tree. That’s right, folks. The felling of a tree. Sweat equity is important to the Bias family. They have a long-standing tradition of self-reliance and a real do it yourself sensibility. They are one of those families who enjoys musing over the fact that their tools and equipment are often relics of a past generation that still work flawlessly, even after decades of hard use. If a new tool is needed, they more often than not create that tool themselves. This is Gene’s forte and as a retired mechanical engineer, he certainly has the skills and knowledge to be more than just a handyman around the house. After retiring, Gene built a workshop where he and his son Curtis build, in addition to the kite reels, furniture and any other “thing” that suits their fancy. He enjoys designing anything new and seeing his designs come to fruition. He passed his values and knowledge along to Curtis in a very natural way — teaching by example as Curtis tagged along to watch him work. Curtis learned rather quickly that if his dad didn’t have something he needed (a tool or jig or whatever), he could build it … and the rest, as they say, is history. Gene and Curtis have a reverence for nature. In particular, they enjoy working with wood. Their earliest wood working projects (things they worked on together)involved building musical instruments, like dulcimers, as well as furniture for their home. 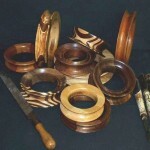 Later, Curtis was taught to turn wood on a lathe and created bowls and Native American flutes. To sum up the value of the many lessons and skills that Curtis acquired over the years, Gene was (and continues to be) instrumental in building the kite reels they produce in their shop. He builds the jigs and does all of the glue-up work for the reels, and Curtis takes over from there. By occupation, Curtis is a professional artist and art teacher at a local school. He has exhibited his art and wood vessels in several one-man shows and has taught literally hundreds of kids to build kites. 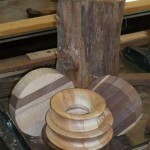 Recently, his wooden Yo-Yo reels have intrigued other artists in the area and they have requested public showings. He has also worked as a textbook illustrator and has been published in no less than eleven books. Curtis simply appears to be one of those individuals who can’t sit still for long without building or creating something new and different. Kites entered into his life in the form of his father’s stories. He recalls hearing about Gene building very large box kites when he lived on the Navajo Indian Reservation near Tuba City, Arizona. Those home-made paper and wood kites would fly for days off the mesas until airborne sand would tear them apart (nature’s own sandblaster). The most memorable story Gene tells about those big kites involves the local children from the reservation. They all wanted to take turns holding onto the line and on one occasion, two small Navajo boys were lifted right off the ground. Gene had to think fast and grabbed the kids before they went over the edge of the mesa. Upon hearing this story, Curtis had visions of flying through the air while being towed by a kite and spent his childhood fascinated by anything that could fly. 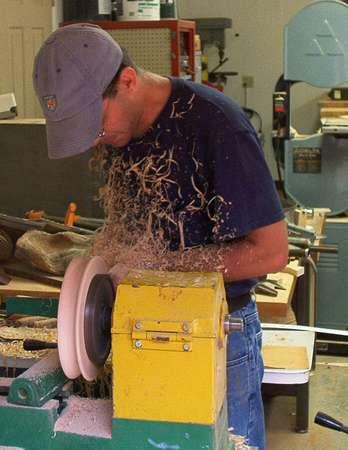 The process of building a wooden reel is fairly simple, IF you have the right tools. Of course, the tools can be very expensive and theshop lathe alone cost several thousand dollars. Many of the tools they use are hand-built for specialized functions and many were created using industrial files. Curtis also has a complete set of turning tools that have been passed down through three generations of wood workers in the Bias family. They are well worn but they are also the best tools in his collection. 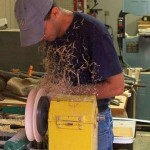 As I have already indicated, building a wood reel begins with the felling of a tree. Many of their reels start this way with Curtis and Gene typically felling trees that have already died. The resulting rough logs are then cut into boards on a portable sawmill and the end grain of the wood is sealed with an oil-based paint. The boards are then stacked for three years to cure, a process that allows the wood to stabilize after most of the moisture has evaporated. 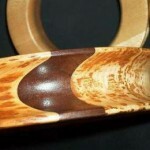 If the wood is used green (uncured), it will split and crack. Occasionally, they will kiln dry wood to speed up the process. 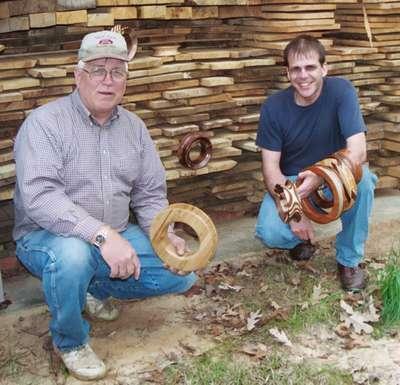 The Bias family gets a LOT of satisfaction from knowing that many of their reels were built from wood grown on their own property. They also use boards that were either purchased or have been collected from a variety of sources over the years. They have some wood that is well over 100 years old! They also have musical instrument grade lumber left over from their forays into musical instrument production andfrom an old violin maker’s shop. They even have furniture grade lumber they use as well and they enjoy building furniture out of the hard wood species of trees, since it tends to hold up better over a longer period. No stains are ever used during construction and they enjoy revealing the grain patterns and colors in the wood that have been created by nature. The function of the reels the Bias father and son team creates is of primary consideration, with aesthetics being a secondary concern. 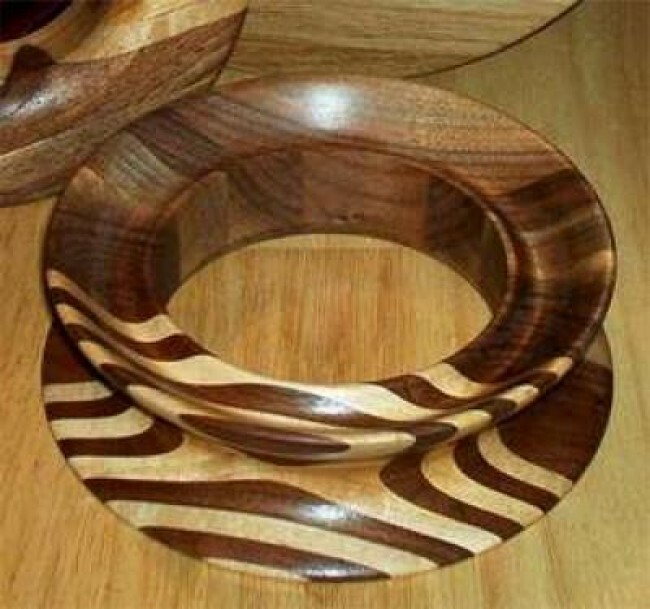 The natural grain patterns in wood are elegant and inviting to many people, are visually exciting and provide intimate contact with one of nature’s treasures. These home-grown products provide a look back in time to a period when self-sufficiency wasn’t just a hobby or a business but was, in reality, the only way to survive in an otherwise hostile environment (the American Frontier). Early pioneers moving across the prairie HAD to possess building skills and out of necessity, those skills were handed down from generation to generation to insure the survival of their lineage. When you actually see a Bias winder for the first time, you’re struck by the obvious skill and craftsmanship that brought about it’s creation. You find yourself drawn into the grain of the wood and just like when you look up at the clouds in the sky, you imagine shapes and images dancing before your eyes. This is only a small part of the beauty of wood and in these days of modern surroundings with concrete, plastic and vinyl virtually shaping our world, it is both refreshing and inspiring to hold an object in your own two hands, so lovingly crafted from nature’s back yard. I don’t often find myself at a loss for words and those of you who know me would undoubtedly say the same thing about me. However, when it comes to those things that leave me awestruck and inspire me the most (the stars in the desert sky at night, standing on a peak in the Rocky Mountains, surviving a pair of typhoons in the North China Sea and everything that Mother Nature has birthed), I usually just stand there slack-jawed in wonder at how something so amazing could even exist. You’ll get an inkling of that same response the first time you see a Bias winder. They are nature incarnate and the skills of two men rolled up into the most gorgeous kite reels you’ll ever see. Try one on for size and you’ll know exactly what I mean. 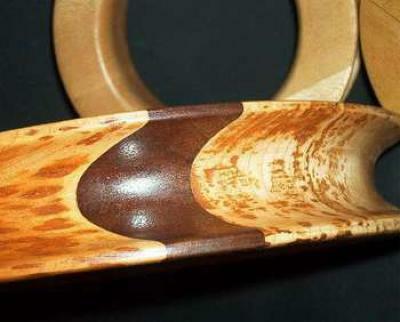 This entry was posted in 2004, Issue 37 (Jul/Aug), KL Archive and tagged reels, winder, wood. Issue 37: We’re on a roll!